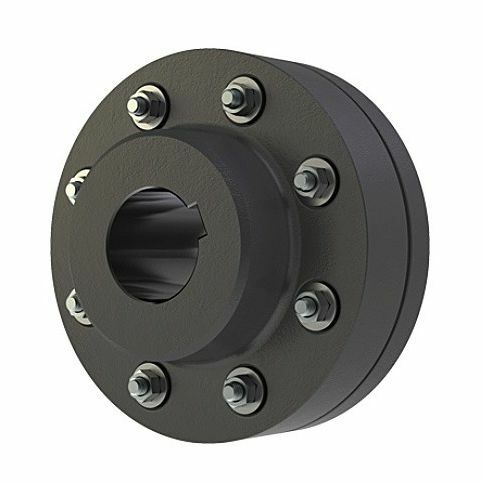 The elfex pin and bush couplings from benzlers is a lubricated grid coupling specifically used on conveyor drives, hoists, fan drives, agitators, packaging machinery as well as pump applications. Its compact design is lubricated with long term grease for minimal servicing and comes in 25 sizes. It has a flexible performance, and a high torque capacity of up to 932,000 Nm. It also utilizes a shaft with a diameter of 508 mm. It comes in 5 types: T10, T20, T31, T35, and T50. The T10 and T20 are both closed couple coupling, while the T31 is a full spacer. The T35 is a half spacer coupling and the T50 is floating shaft coupling.